Having completed her mourning on the sixth anniversary of her husband Otojiro痴 passing, Sadayakko Kawakami set up Kawakami Silk (Kawakami Kenpu) Co., Ltd., a purveyor of the finest silks for export in the Ozone district of Nagoya, and built a new residence, Futaba. 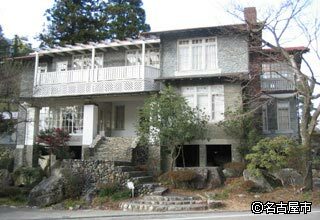 Sadayakko lived here with the so-called king of electric power, Momosuke Fukuzawa, whom she had known since around fifteen years old. Dubbed 擢utaba Palace・ the residence sat on a property stretching more than 6,000m2. The sheer opulence of the Futaba Palace, with its red roof, radiant green grass and fountain, wowed guests at garden parties. This is where the silk company that Sadayakko Kawakami set up in 1918 was located in Kami-Iida. The company employed forty or fifty female teenagers in the factory. They worked 45 minutes on, 15 minutes off, and all wore navy blue sailor suits and shoes, looking more like schoolgirls than anything else. On the site, there were tennis courts and a swimming for their recreational facilities. All of them lived in a dormitory, and took evening lessons in the tea ceremony, flower arrangement and Japanese dressmaking; while on days off, the factory girls often put on their own variety shows. Given that this was a time when people worked under stern conditions for a pittance, we can infer that Kawakami Silk (Kawakami Kenpu) was a revolutionary new company that gave its factory girls a package allowed them to lead a life that others could only dream of. Silks produced in Kawakami Silk factory boasted high quality, and were exported to France and a number of other countries; and the sitting cushions in the Japanese room of Futabakan, the former residence of Sadayakko Kawakami, are covered with silk made at Sadayakko痴 own factory. 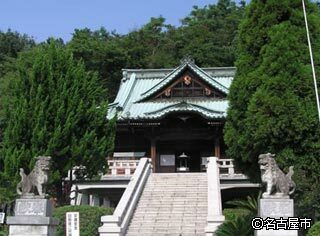 Teishoji Temple (literally "the temple of Sada shining") was established by Sadayakko in 1933; it is her final resting place. The temple has a facility chronicling Sadayakko's life, with a range of valuable materials and personal effects that sadayakko and Momosuke bequeathed available for viewing. In front of Sadayakko's mausoleum is a statue of the goddess of mercy, which stands calmly facing the Oi dam in Nagano Prefecture that Momosuke constructed. With its striking Deva gate and numerous carvings, Teishoji Temple is perennially popular with celebrities who come to pray for artistic success. <JR> 5 or 6-minutes・taxi ride from "Unuma"
<Meitetsu Train> 5 or 6-minutes' taxi ride from "Shin-Unuma"
Open: 09:30-16:30 between mid-March and November 30. The "king of electric power", Momosuke Fukuzawa built this structure as the Kiso base for power resource development in 1919. It is said that he often came here with Sadayakko Kawakami. The second floor of the building was lost to fire on April 6, 1960, and it was opened to the public as the (one-storey) Momosuke Fukuzawa Memorial Hall in 1985. The second floor was reconstructed in 1997, thus restoring the building to its original countenance. Famed as an invaluable example of Western-style "country house architecture" in the Taisho Era, the hall exhibits photographs, personal effects and other materials pertaining to Momosuke and Sadayakko. 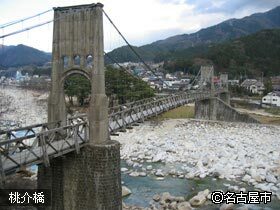 Also, there is the Momosuke Bridge nearby, built for Momosuke's construction of a dam in the area. The beautiful span is a treasure from the days of Japan's press for modernization, and has been designated as an important national cultural asset. <JR> 5 or 6-minutes' walk from "Nagiso"
<By Car> Take national route 19; turn left at Nagiso Stn. ; on the right after crossing Mitono Ôhashi bridge. This substation is closely linked with Momosuke Fukuzawa. As the civilization and enlightenment of Japan spread to Nagoya in 1887, Nagoya Electricity (Nagoya Dento), Co., Ltd. was set up by a group comprising mainly samurai of the former Owari Clan, bringing electricity to the area. 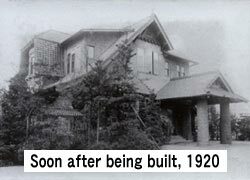 In 1906, Nagoya Electric Power, Co., Ltd. was set up with noted industrialist Eiichi Shibusawa as advisor, taking up a position as rival to Nagoya Electricity (Nagoya Dento). It was at this time that Momosuke became major shareholder of Nagoya Electricity, and he was appointed chairman in 1910. The following year, the Hagino Power Station was completed together with its counterpart in Yaotsu, and power supply services began in December of that year. January 1912 saw Hagino achieve Japan's first successful high-voltage transmission, with some 60,000 volts sizzling the lines, making use of what were, at the time, leading-edge technologies. Within what is now Kita-ku, electricity supply services began in Yamada in 1915 and 1916, Nishi-Shiga in 1917; allowing a move from oil lamps to electric lights. Subsequently, the number of companies setting up in Nagoya to take advantage of its abundant electric power resources mushroomed, providing impetus for the industrial advancement of the city. A nationally-designated important cultural properties, the Yomikaki Power Station was completed in December 1923. At the time, it was a conduit-type plant with a maximum output of 40,700W, and dwarfed all other power stations in Kiso-gun. With a steel-reinforced concrete structure, brick walls and flat roof, its half-circle windows and skylights that shoot out above the roof gave it a very modern design.